Rina Arseneault, associate director at the University of New Brunswick’s Muriel McQueen Fergusson Centre for Family Violence Research (MMFC), received the Governor General’s Award in Commemoration of the Person’s Case on Dec. 14 in Ottawa. The Governor General’s Award in Commemoration of the Persons Case is given to individuals who have made outstanding contributions to the goal of equality for women and girls in Canada. This year marks the 25th anniversary of the MMFC, as well as the year of Ms. Arseneault’s retirement. As she prepares for retirement on Dec. 31, Ms. Arseneault has been reflecting on her life, the evolution of her career and where she sees the centre at their 50th anniversary. Ms. Arseneault has always considered herself a feminist. Born in the village of Atholville, N.B., Ms. Arseneault was the 13th of 14 children. Growing up, contributing to the family trumped education. As with many of her other siblings, she was expected to drop out in Grade 10 and find a job. But Ms. Arseneault had other plans. “I was always arguing and pushing. My mom would say, ‘you were a wonderful challenge,’” she says. To continue going to school, Ms. Arseneault decided to move in with a family friend who had medical issues. She did housework in exchange for room and board. After completing high school, she attended Université de Moncton. Two years into her psychology degree, Ms. Arseneault enrolled in a paid program that trained her to be a psychiatric attendant at the provincial hospital in Campbellton. Working in the women’s ward in the 1970s, she saw first-hand the toll family violence played on women, families and society. The experience at the women’s psychiatric ward inspired Ms. Arseneault to go back to school in Moncton to complete both her bachelor’s and master’s degrees in social work. She also worked at a women’s shelter while completing her degrees. The MMFC opened in 1993. Prior to opening, the president of the New Brunswick Coalition of Transition House called and said that she sent a letter of support for Ms. Arseneault. She believed that Ms. Arseneault was the perfect candidate to bring the community’s voice to the research centre. “The first five years at the centre were about building partnerships. People often thought of research as a project with a start and a finish. Researchers were supposed to be on the outside looking in. But the MMFC believed then, and still believes now, that we needed to do action-oriented research in collaboration with community and government,” says Ms. Arseneault. The MMFC has not only brought groups together in order to dig deeper into the root causes of family violence, but they’ve influenced change. The centre’s research initiatives have had a powerful effect on legislation and policies within New Brunswick, both at the provincial level and within the private sector. Now, 25 years later, the MMFC is a leader in family violence research and the provincial government makes sure that members of the centre are there when making important decisions regarding policy and legislation. Rina says that by the centre’s 50th anniversary, they will have found the answers to many questions, but there will be more issues to solve. 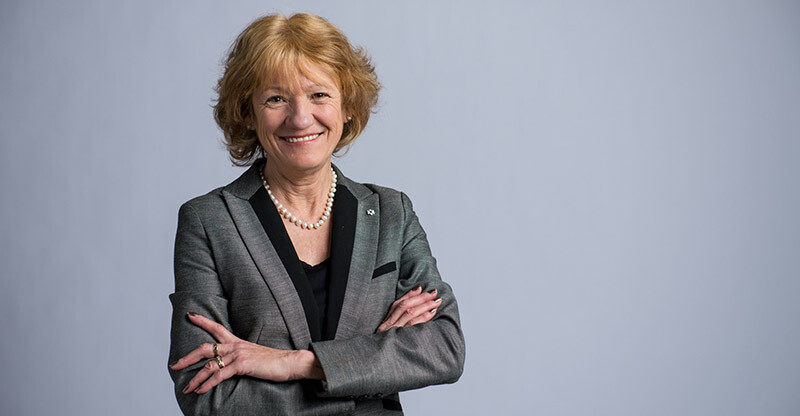 As Ms. Arseneault prepares to retire from UNB, colleagues have been reflecting on the significant contributions she’s made to the university and beyond. It’s easy to see why she’s been chosen to receive the Governor General’s Award in Commemoration of the Persons Case.